Last few weeks flew by rapidly that I was not finding enough time to check my favorite blogs. Summer is at its brim and you wish you could whip up something to utilize the splendid sunlight that last till the dawn around 9:00 pm. But outdoor activities and gardening is taking most of my time these days. Yes, I had started my outdoor gardening and the plants are in their very immature stage and I am impetuously waiting to see them bloom and fruit. An easy make ahead healthy breakfast is my motto these days. Banana flavor was never my favorite as I am not a banana lover opposed to my hubby. So I usually buy them for my hubby and he finishes them before they over ripe. 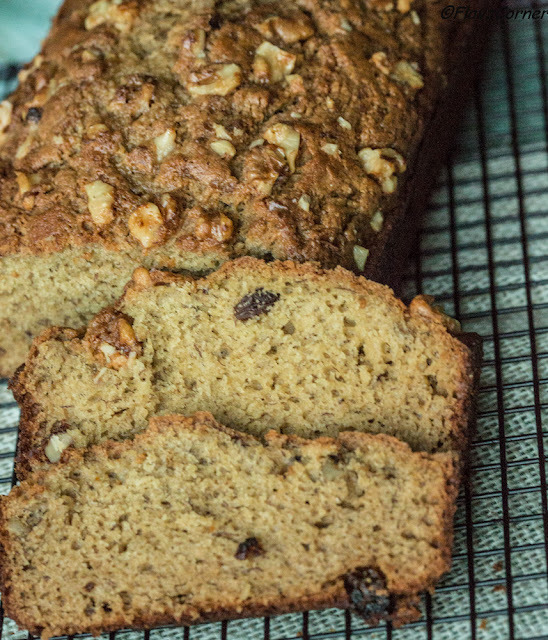 But during summer season, I always had the problem of over ripe bananas and I used to waste a lot of bananas till I started making these banana bread. 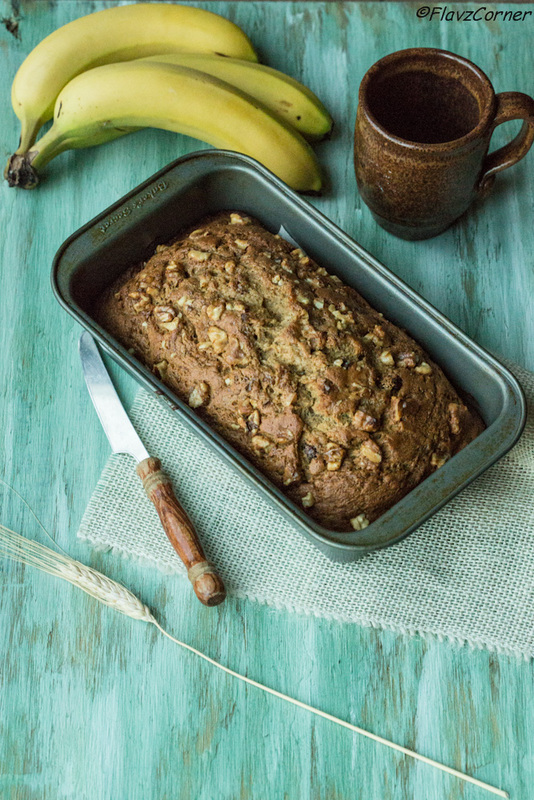 To balance the nutrition, fiber and fat content, I tried several version of banana bread by altering the ingredient and this is the final version which fitted my family's taste. 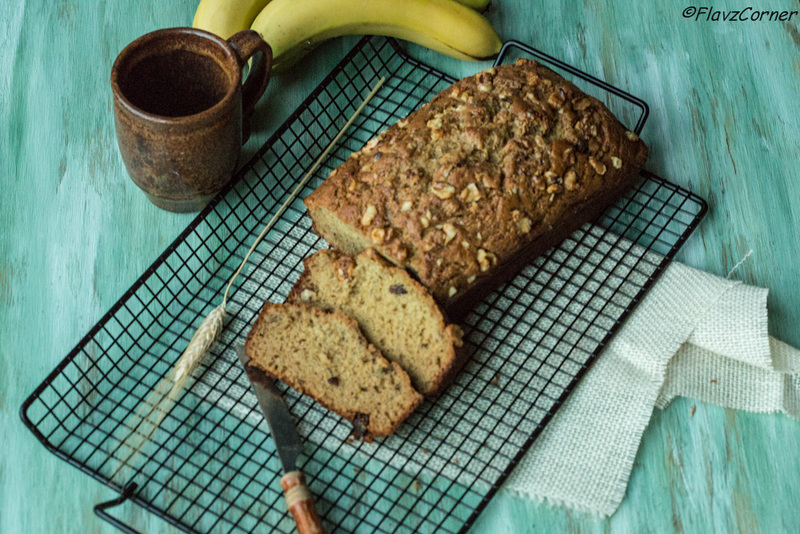 This is a perfect soft healthy banana bread loaf which is not over sweet and still has the natural flavors in it. My taste palate has changed so much that I started liking the banana bread now. This bread is highly volatile in my family and I am sure you will love it!!! Mix eggs, sour cream, oil, mashed bananas, brown sugar, vanilla extract and milk using an electric mixture till well mixed. Sift together wheat flour, salt, baking powder and baking soda in a separate bowl. Gently add the sifted wheat flour mix into the wet ingredients and mix for 1 minute. Fold in the raisins and chopped walnuts into the batter. Pour into a greased loaf pan lined with parchment paper. Sprinkle the 1 tbsp chopped walnuts on the top of the batter and using a rubber spatula press the walnuts gently down on the batter. Drizzle 2 tbsp of pure maple syrup on top of the batter. Bake for 50 - 55 minutes or till a toothpick comes out clean when tested on the center of the bread. Use overripe bananas for better flavor and taste. This bread is not over sweet. So if you like your loaf to be sweeter, adjust the brown sugar. The loaf can be stored in air tight container outside for 1 day. To store for more days, keep the loaf refrigerated in air tight container. I hate to eat overipe banana's so I always look for recipe that use them because I love them in muffins and bread. This looks super delicious Shibi and hence bookmarking! We love bananas, so they don't last long in our house. So whenever we want to bake banana bread, we always have to buy extras! Which we do from time to time, because it's so good. Love your version - the touch of maple is nice. Thanks for this. I love that you've made this loaf with so much whole wheat flour. So healthy! I agree, I love simple and easy breakfast like this one too. :) Glad you use whole wheat for this bread, more healthful. Thanks for sharing! Happy gardening and baking!